Get the perfect viewing angle every time with this universal tablet and phone stand. Great for reading, watching movies, and even video calls or use while cooking. Just flip it, stick it, and stand it for handsfree viewing. 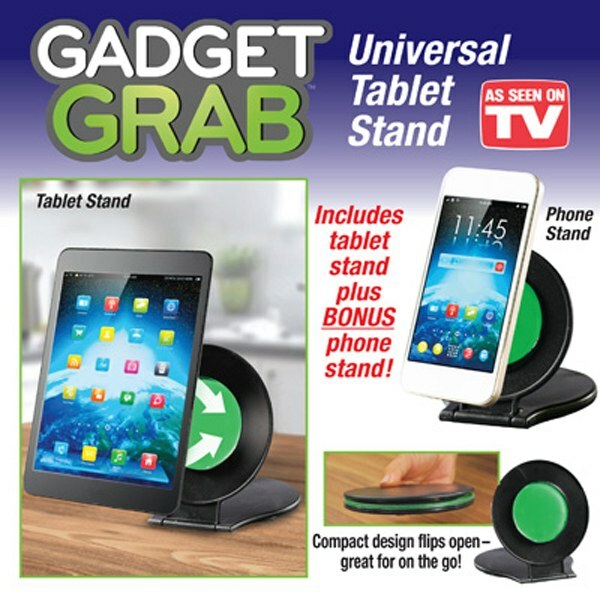 Gadget GrabTM Get the perfect viewing angle every time with this universal tablet and phone stand. Just flip it, stick it, and stand it for handsfree viewing. The Gadget Grab is awesome. It comes with a phone and a tablet stand. It holds your device vertically or horizontally. All you have to do is flip open the compact stand; press your device firmly against the green part of the stand, which is like suction cups that holds your device in place, so now your hands are free. Great for taking selfies, watching a video or listening to music. You hands are now free to do other things than hold your gadgets!!! The Gadget Grab will hold your phone or tablet for you!!! Does the job of holding your devices up securely. It does the jo]b! !